If you are an avid hiker you will undoubtedly know how important keeping yourself warm and insulated is. The often most important part of this equation can be directly related to having a strong and durable base layer that not only insulates and keeps you warm but also allows your pours to breathe so you don’t start sweating profusely. Finding a quality option can be tricky but lucky for you I have done all the leg work, so you don’t have to. 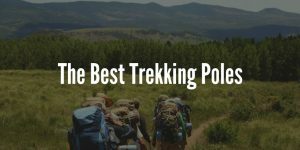 Below are my favorite 5 options primarily with hiking in mind. If I had to choose one base layer to suit most people’s needs I would have to choose this one. It has all the quality and design elements you want and need from a good quality base layer. Let me explain why. This is a great choice for all year round – in the winter it will undoubtedly keep you warm and cozy thanks to being made from merino wool. Not only that but you can easily wear it in the summer and still feel comfortable as well. When I was walking, and the air was flowing I felt comfortable even on a hot summers day – I worn it with a small rain coat over it also and it worked a charm. Another great thing I really liked with this material is that even when I was sweating for many hours on end the material never smelt bad even after multiple days of usage. 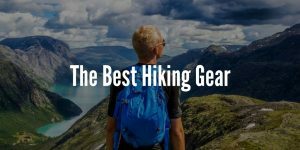 It seems to repel the sweat and therefore it doesn’t start to smell even after long hikes. The material itself is also very comfortable and was a nice fit for me in the medium size (6ft tall average build). If you are on the market for a quality base layer and don’t want to break the bank, then this could be a great choice for you. It is a quality product at a very reasonable price point. This base layer is made from a polypropylene, not only is it soft to the touch but it is wicked which stops it from adsorbing sweat. It also it very breathable yet insulates very well also. 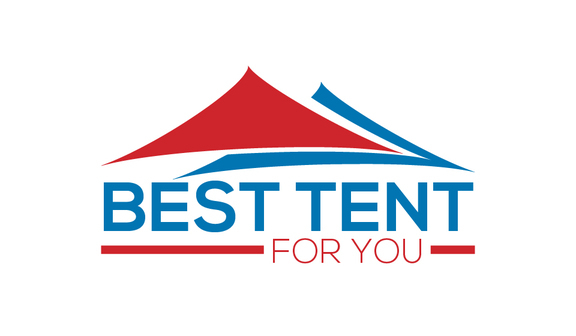 Also thanks to the material that has been used you can dry it out in only a couple of hours which is really useful when you are out hiking, camping etc. Another thing that stood out to me that it’s quite lightweight, yet I was still impressed with the quality of the material. If you are looking for a tight fit this isn’t the best choice for you. It’s more designed to be a slightly looser fit which some people prefer. 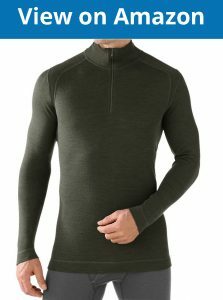 If you are looking for a base layer to be used primarily for colder weather, then this is your best bet. This base layer shirt is made from 100% merino wool. This basically equates to some of the best material for keeping you warm and well insulated even in subzero temperatures. 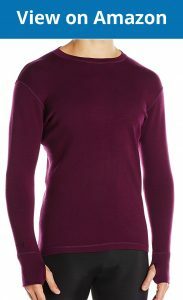 This base layer has to be the softest material of any base layer that I used – it’s incredibly soft not to mention it looks really high end and fashionable. While I have said this is the best choice for winter you could easily wear it on its own in warmer months and it would still be a great choice as well. How the material is cut and how it fits is also one of my personal favorites. It isn’t tight, but it fits really well and for my preference it’s a perfect choice. It’s also worth mentioning they have implemented the sleeves so you can put your hands through to keep them warmer which is a nice touch. Just like the previous option this Smartwool is made from merino wool and is knitted in Vietnam and has a slim fit design. 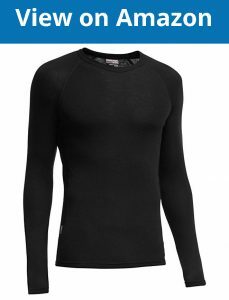 This base layer has the two most important things for a base layer – it keeps you really warm and its incredibly comfortable thanks to the high-end merino wool that has been used. This base layer is perfect for cold weather hikes because of how incredibly warm it keeps you. Plenty of people use it for snowboarding and the like so it will definitely be up to any task you throw at it. 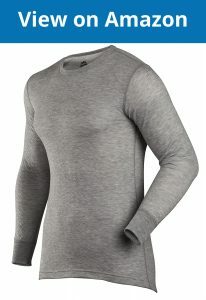 As I stated before this base layer is made from merino wool which has natural anti wicking properties. This stops the material from absorbing sweat and it also dries very quickly after washing. I wanted to include another base layer that offers the quality and at a low price point. 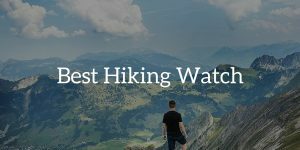 If you are an adventurer and a bargain hunter this will likely be your best choice. 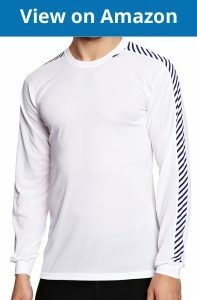 The main thing that stood out to me with this base layer is that is isn’t just a singular layer but a dual layer. This really makes it a perfect choice for keeping you warm and it’s definitely a bit thicker than most other base layers I have used because of this. Though even while it’s thicker it is still lightweight. It’s made from 70% polyester and 30% merino wool..
One other thing I enjoyed with these is that even was I was doing heavy activity in them I didn’t overheat and become too warm – so their breathability is quite good as well. The material is also surprisingly soft for a product of this price and that’s another reason it’s a great bargain buy!